I’ve recently enjoyed reading an article from Steve Watt on the ABM hype cycle. 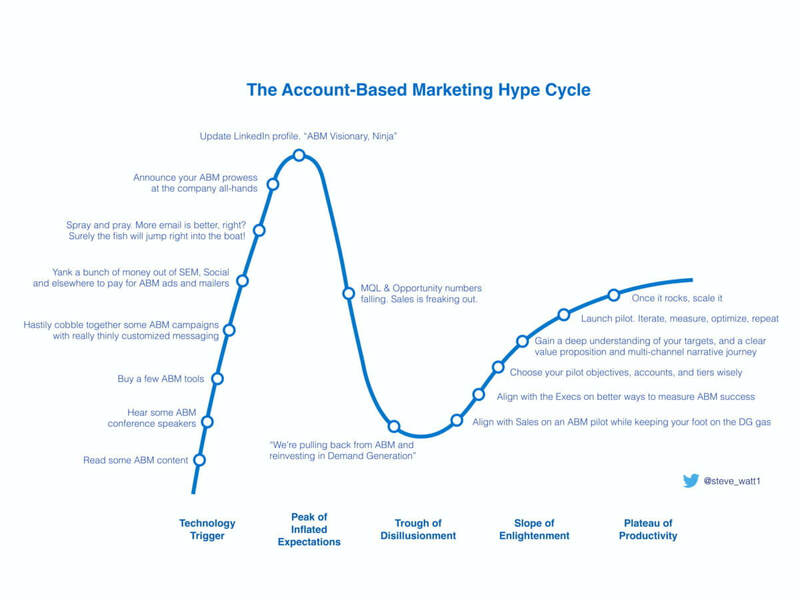 The article takes the Gartner hype cycle concept and plots the stages of ABM adoption. From a fast start… a premature celebration… a painful decline… and then a methodical rebuild and solid adoption. I can easily relate to many of the milestones that Steve calls out, with a personal favourite of “announcing ABM prowess at the company all-hands”. How many of you have been tempted to do this before really stress-testing what ABM means for your organisation? Of course, none of us want to start at pace only to exhaust the business and stumble into the trough of disillusionment. So let’s pause for a moment. It’s easy to be seduced by all the noise surrounding account based marketing. And as the world’s only dedicated ABM agency, you’d be forgiven for thinking we’re thrilled with all the attention. But in reality we’re having to say ‘no’ to lots of prospective clients who are undertaking ABM for the wrong reasons. Here’s the deal – if you want to cut corners, are resourced strapped and haven’t yet allocated budget to accounts – then it’s not the right time for ABM. Shortcutting ABM is a waste of time and won’t deliver those big deals you’re hoping for. If your propositions are super simple, sold in volume or targeted at small-mid size companies then it’s unlikely ABM is a good fit. Your deal sizes just don’t warrant the investment ABM demands. I get it, you’re facing more competition, it’s noisy and you need to break through. There’s nothing to stop you doing account-based advertising or targeting, but this isn’t ABM. Research from ITSMA shows that 75% of executives will read unsolicited marketing materials if relevant to their business. And 92% will pay attention to these materials even from providers they’ve not done business with before. But the key here is relevance. Adding creepy personalization does not equal ABM and it certainly doesn’t equal relevance. You can’t skimp on the human effort needed to craft account-centric propositions, messaging and creative. But with an average click through rate of 0.1% this is not going to deliver game changing ROI. Using campaign tactics to a set of targeted accounts is a campaign. ABM is not a campaign, it’s a strategy. ABM is a long-game, not a quick fix to fill a revenue hole. And at the centre of the ABM mindset is the concept of customer centricity – not your quarterly sales targets. If you’re serious about ABM you need to be looking further out and more at customer lifetime value. Of course, they’ll be incremental benefit along the way but be realistic – particularly with sales teams. To deliver business impact with account-based marketing – and to truly move the needle in your most important accounts – requires hard work, setting the right expectations, aligning smart multi-disciplined teams and embedding a customer first mindset. I recommend you avoid racing into the trough of disillusionment by pacing your ABM adoption. In fact, we have our very own perspective of what this looks like, having worked with dozens of clients from early pilot to full programme implementation. Get in touch if you’d like to find out more, I’d love to hear your thoughts.